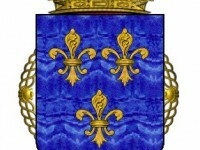 Heraldikum has manufactured one more coat of arms. It is coat of arms of family of Mr. Radivoje Miletić from Australia. Coat of arms is registered at The Board for Heraldic and Genealogical Studies (BHGS). Blazon of the coat of arms is created by Mr. Jovanović from BHGS and emblazon is created by Mr. Nebojša Dikić, heraldic artist from BHGS. Shield – Gules, sword erect Proper between a lion rampant Argent armed, langued and tail tufted Or and a unicorn rampant Argent armed, langued, crined, unglued and tailed Or combatant, between a mullet of seven points in chief and a Kosovo Cross under two bars wavy in base all Or. Crest – Upon a helm, wreathed and mantled Gules doubled Or, dexter hand Proper holding a firesteel inverted Or overlapped by a golden wattle (Acacia pycnantha) wreath in blossom Proper. Motto – BOLDNESS NURTURES SUCCESS. We wish Mr. Miletić and his descendants to bear this coat of arms for many years to come.